The international conference "A Panchromatic View of Solar-like Stars With and Without Planets" was the third meeting in a series aimed at stressing the importance of stellar physics to our understanding of the properties of stars (and their progeny) and of stellar systems at different scales. Solar-like stars have been the subject of detailed analysis for many years. Nevertheless, interest in these stars has been magnified by the discovery of more than 800 exoplanets. In 2012, the third "New Quests in Stellar Astrophysics" meeting focused on one of the most active research areas of contemporary astrophysics: the star-planet connection. More than 60 participants from 14 countries reviewed a wide variety of topics in 53 oral and poster contributions, from IR and sub-millimeter surveys that portray the various stages of planet formation and evolution, to the optical and UV spectral properties of stars and their correlations with the presence of planetary companions, including stellar activity, chemical abundance analyses, and obstacles in planet searches. 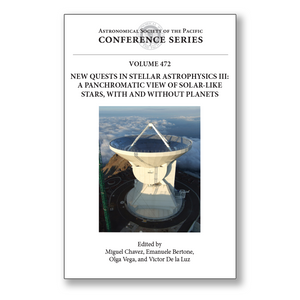 The contents of this volume provide a fresh global perspective on the properties of solar-like stars and their (proto) planets that will be useful to researchers already immersed in the field and young astronomers at the beginning of their careers.